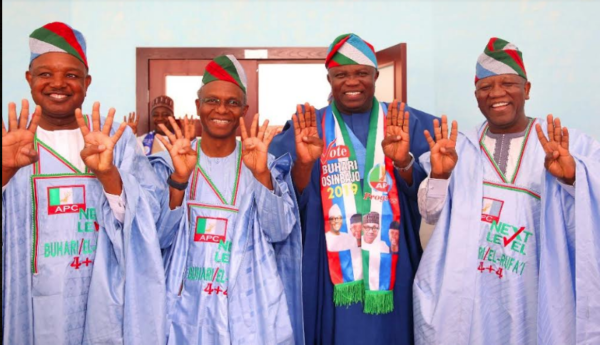 Lagos State Governor, Mr. Akinwunmi Ambode on Saturday assured President Muhammadu Buhari that residents in Lagos would troop out enmasse on February 16 and deliver the State to him and other National Assembly candidates of the All Progressive Congress (APC). R-L: Zamfara State Governor, Alh. Abdul’aziz Abubakar Yari; Lagos State Governor, Mr. Akinwunmi Ambode; Kaduna State Governor, Nasir El-Rufai and Kebbi State Governor, Abubakar Atiku Bagudu, during the All Progressives Congress (APC) Presidential Campaign in Kaduna State, on Friday, January 18, 2019. “We are paying off debts that were not even publicly acknowledged before now, including those owed to States, the electricity sector, oil marketers, exporters, backlog of salaries of workers and pensioners, amongst others,” he said.